Our goal is to revolutionise cycling through beautiful high performance ebikes at very competitive prices. High quality manufacturing and your satisfaction are our priorities. We developed the FX, a full carbon folding electric bike. At 15kgs, it is one of the lightest electric bikes in the world. Its frame is carefully engineered to be folded in seconds. It is easily transportable in both its folded and unfolded configurations. All its electronics are integrated within its body so that riding it offers you comfort and fun with no compromise on style. The FX is equipped with a powerful rear motor, hydraulic disk brakes, 9 speeds Shimano gears, an advanced 5 level computer and offers more than 55km of range at an average pace (375Wh removable battery). The FX is currently available on our website with great discounts and free delivery anywhere in the UK. PLEASE NOTE: Transport for London does not arrange test rides. Please take reasonable precautions for your own safety. We recommend test rides take place during daylight hours, in a public place. We offer test rides in Hyde Park anytime along the week! Simply contact us via our website and we will arrange it together at your best convenience. There is no deposit nor obligation to buy, we just need your ID. ENJOY MORE THAN £300 DISCOUNT! To inaugurate our launch and reward our new customers, we are offering more than £300 OFF on all our bikes when ordering through our website! 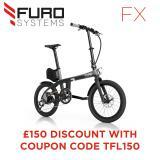 As a special offer to all new customers that discovered us through the TfL website, we are offering an extra £150 OFF your cart on the FX in addition to our other offers when you order through our website. Just enter the coupon code TFL150 at checkout. All Accessories Offered With New Order!